There is now little doubt that we are about to see an exponential growth in connected devices. 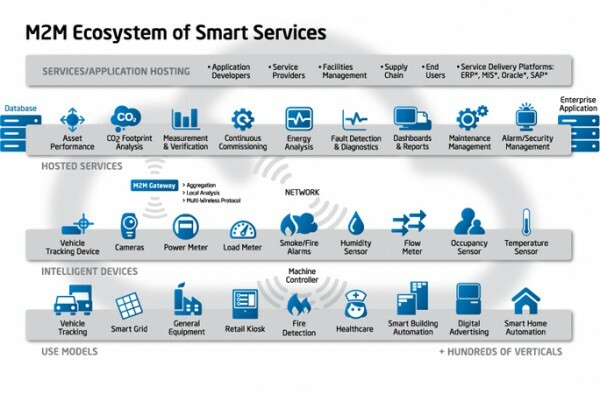 This will lead to what is referred to as the Networked Society or the Internet of Things. Ericsson predicts that there will be up to 50 Billion connected devices by 2020. What is more difficult to predict is who will shape this industry as the value chain is fairly complex and the eco-system is fragmented. 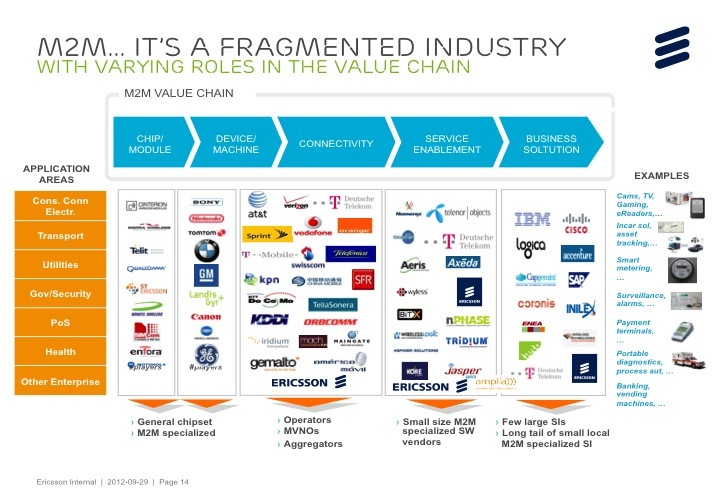 Operators are today providing connectivity services and want to move up the value chain, either by providing service enablement functionality or industry targeted business solutions. Consulting companies on the other hand might try to keep it a complex system integration business, while specialized service providers focus on providing value in specific verticals. 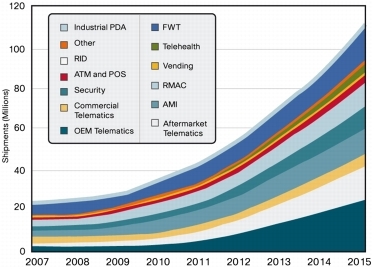 I believe now is the right time to disrupt this M2M/IoT industry. Take an OTT approach and put all your efforts on innovation and value creation. Why? Because the cost of developing, integrating and deploying new solutions goes down close to zero. Entry barriers for new companies are vanishing really quickly. Here are four trends that support this thought. Today almost anybody can start prototyping to create connected devices at low cost. Arduino, for instance, is an open-source electronic prototyping platform allowing to create interactive electronic objects. With arduino you can create and control simple objects, sensors, all of this for a handful of dollars. For less than a hundred dollars you can even connect to the internet over a mobile network. Similarly, for more complex control, it can be enhanced with cheap processing power, the Rasberry Pi is a 25 USD, credit-card sized computer that plugs into any HDMI TV and USB keyboard/mouse. It includes an ARM chip that is powerful enough to run Linux and a full Java Virtual Machine. The possibilities are endless. Standardization is also moving to make things easier. ZigBee protcol and Zigbee alliance is an example of such a simplification initiative. ZigBee is an open global wireless standard to address the needs of low-cost, low-power wireless M2M networks. ZigBee applications include wireless light switches, electrical meters with in-home-displays, traffic management systems, and other consumer and industrial equipment that requires short-range wireless transfer of data at relatively low rates. Technology is also evolving and supporting move innovations. Bluetooth Low Energy (BLE) appears to have solved some of the energy consumption problems of sensors since these sensors can last 1-3 years with the same battery. iBeacon, a technology derivative of BLE, is now also getting widely adopted. Some companies like Estimote, WiMoto or Blesh have quickly understood the potential and are provide sensors and toolkits that allow you to collect more data and create value. There is a big shift in the industry that is happening as we speak and you only have check the number of Crowfunded projects to see how big this trend is becoming. Now is the time for the emerging maker generation. Appearance of opensource M2M platforms like DeviceHive provide now also the communication layer needed to control multiple devices and sensors that can be used to develop home automation solutions, energy management solutions and much more. These M2M platforms provide also the basic functionality to provision, manage and control multiple devices that are part of an M2M enterprise solution. The platforms also support simple API’s based on HTML to address a large developer community. Deploying an opensource M2M platform on a public cloud provides a very attractive go-to-market approach for anybody that wants to become an M2M specialized service provider. Not much is required to get started. With the cost drastically decreased, more innovation will come from the end-users within each vertical. I could easily imagine larger communities like cities develop their own M2M solutions and manage it in order to optimize urban development and public spending. Why not? With the development provided by HTML5 we can now also embed real time communication capabilities in web pages. This allows for rapid UI design, clever mash-up and a complete new type of interactivity. WebRTC is part of these new communication capabilities that can easily be embedded in Web Pages. Whether it is voice, video, messaging or document exchange it can now all very easily be provided from a web page. I have now doubt that these technologies could easily be used to develop home automation or energy management solutions that can be controlled from a tablet or mobile device from anywhere in the world. I believe the Internet of things provides huge opportunities for innovation, substantial growth opportunities and an entry barrier which is fairly small. Beside the availability of open source technology to reduce production cost, operational costs can be reduced thanks to cloud. And why not use social media to build-up your M2M tiger team and for the funding try to expose your project to crowfunding platforms like Kickstarter. In Kickstarter project creators get funded by the community. They set a funding goal and deadline. If people like a project, they can pledge money to make it happen. Funding on Kickstarter is all-or-nothing — projects must reach their funding goals to receive any money. Kickstarter is very effective in creating momentum and rallying people around an idea. Backers are supporting projects to help them come to life, not to profit financially. Instead, project creators offer rewards to thank backers for their support. Kickstarter takes a marginal 5% fee to the funds collected. I believe that with the current technology development, fragmentation of current M2M value chains the opportunity is there for anybody to take a strong position with niche industry solutions. The entry barriers are pretty low. For the consumer market, applications like home automation and energy management are probably good places to start, but I think there might be huge possibilities as well in sectors like e-health and quantified self. Enterprise segment might be difficult to enter for startups, since it is ofte about optimizing current business processes and using M2M to reduce costs. From telemetry, to POS, Securtiy or Vending machines the industry specific requirements will usually make it more or less easy to enter that particular market. When it comes to industries to target there are plenty and the shipment of connected devices per segment is going to surpass 100 Million per year in a couple of years only, according to an ABI research report, so plenty of choice. I believe now is the right time to disrupt this M2M/IoT industry: Affordable devices and sensors, reduced costs through cloud and opensource, Application design requiring less coding and finally crowdfunding allowing you to quickly validate and fund your ideas. All the conditions are right, now is the time to Make it happen. What is bigdata and what are key operator data assets? In a nutshell bigdata is about getting actionable insights from data which is available in huge volumes, has high velocity and is often found in a big variety. These are the so called 3V’s of big data. While the volume definition is very clear, with velocity we mean data which is of value only for a short period of time, possibly a few minutes or less. The variety of the data is also a bit difficult to understand at first. Here we talk primarily about the huge amount of unstructured data which is today hardly harvested, as an example you can think of insights found in text, images and video. Data amounts available to analyze are huge and grow exponentially. An IBM study showed that 90% of all data available in the world has been produced over the last two years only. Operators sit today on huge amounts of data themselves, but few have started to monetize that knowledge neither internally nor externally. There is probably different ways to segment the operator’s data assets but the taxonomy I used below is simple enough so that anybody can get a feeling for the types of use-cases that could be monetized by Telco’s. This taxonomy is based on different types of contexts which provide value to the telco or to a third party. Now for privacy reasons much of this data cannot be exposed without the consent of the end-user, unless there is an opt-in close when subscribing to a service. In any case the data can most of the time be made anonymous and brokered as such. The opportunities for Telco’s are numerous but can be seen as internal and external opportunities. Improving retention and revenues by becoming more customer centric and better managing the customer experience is an internal usage of these insights, while an external usage is to provide new services to enterprises that will help them to improve their own efficiency and decision processes. In this post I will only cover the external bigdata opportunities. 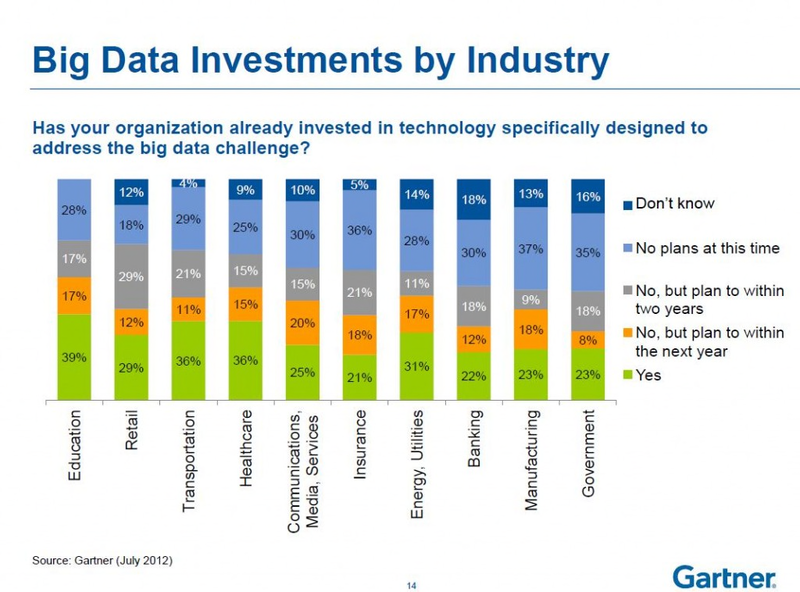 From a 2102 Gartner study you can see that most industries are in the process of investing or a planning to invest in Bigdata technology of the next 2 years. Rather than further increasing ICT spending and OPEX in the enterprise their is an opportunity for operators to provide cloud services and become the technology partner for bigdata. While telcos are probably a bit late to the market with cloud services compared to companies like Amazon, operators have still a privileged position when it comes to trust, security and service level expectations. Telco’s are still privileged partner for larger enterprises, industry verticals and government mainly because of their local presence. This is why they need to invest in this area now or necessity will take over to find alternative providers. For Telco’s the opportunities in bigdata when part of a cloud offering, can probably count the folowing non exhaustive list. For enterprises that collect or want to collect data, they will rapidly have to consider how to store that data in a cost efficient and scalable manner. This is where telco’s data center could be used to provide elasticity and handle that demand in a cost efficiency way. Of course depending on the type of enterprise data, there are important questions to address when it comes to privacy, integrity and security of the data, but operators are probably well positioned to offer Data-as-a-Service to different industry vertical according to the enterprises expectations. The tools and processes needed to gain insights require major changes and investments in the enterprise. Now even if you have data and can store most of your data, it sill requires new tools and competences to be able to gain insights from that data. Telco’s could play a major role in taking bigdata to the masses, especially toward the SME’s where efficiency and agility is so important. Providing business intelligence reports, visualization capabilities as well as dashboard views are few of the Basic mechanisms to put in place. The data operators own has even more value if consolidated or federated with other data sources like social media, government or enterprise data. If this data can be exposed and analyzed it will provide further insights that a government, large enterprise or industry verticals will be ready to pay for. A said earlier, operators have a privileged position when interfacing governments and regulators and should leverage that position. In order to stay competitive and sustain economic growth governments need to take faster and smarter decisions. This often means collecting and analyzing more data to improve the decisioning process. By leveraging on bigdata technology, federation and analytics, operators could find new means to address value chains for which they were today only providing connectivity and communications. I won’t be able to cover all bigdata opportunities where telco’s could provide value, but nelow you will find a couple of examples where big data could be useful and it will show how that could help operators position themselves in new value chains. A simple example that could be considered here is how an operator can use big data to combine multiple structured and unstructured data sources to provide additional value to vehicle fleet management solution. Analyzing social media streams, outgoing calls or lack of movement along certain roads, can help provide real-time information that could be useful for redirecting vehicles or a whole fleet. In addition the operator can combine this services with automated communication to guide a track, bus or taxi toward the right destination in real-time. Automative industry, Health care, Telemetry and most industries using M2M sensors could benefit from bigdata and analytics to increase the value or services offered by operators. For advertisers and retailers targeting the right audience and the ability to prove that you can address the right audience is worth heavy dollars. The propensity to buy for a customer is heavily correlated to how much know about that person, it tastes and preferences. 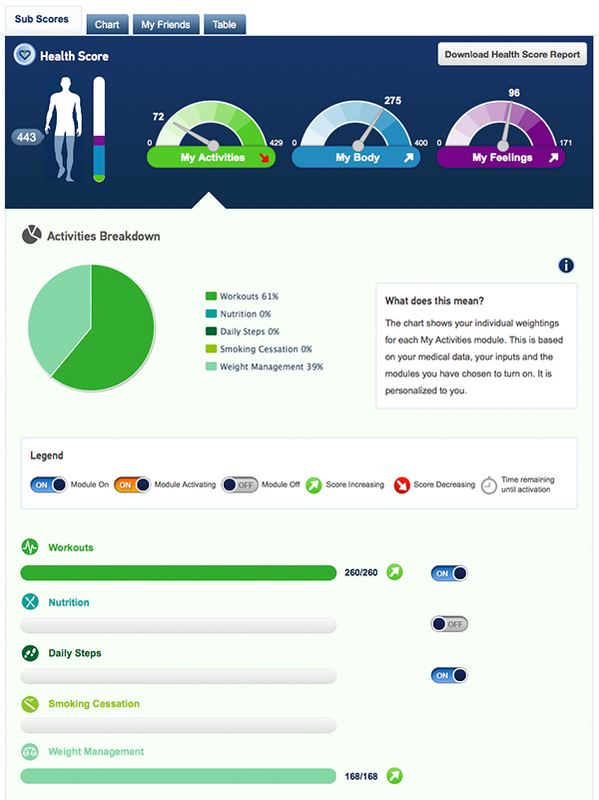 Operators have a lot of information about the user profile, but more could be collected through the various portals and even through packet inspection. By analyzing consumer likes on social networks, purchases on amazon or zapping patterns on an IPTV system a lot can be learned and shared. Urban planning can certainly benefit from the insights operators have in terms of road traffic development and customer segmentation in order to improve build-out of new infrastructure, including roads, housing, schools and hospitals. Take the example of a mall where you have cameras monitoring everything that happens. Quickly analyzing what happens over multiple video streams to identify a theft and identify the person would require real-time processing and federation over multiple data sources. Operators could be a natural broker for this type of use-case. Many more industries and verticals could benefit from bigdata investments, but it would be difficult top properly cover all of this in one post. If there is interest from the community I will write separate post on how big data can help Education and Healthcare, which are two topics that deserve their own analysis. Finally, BigData as a means for Telco’s to become a community as well as a lifestyle provider? 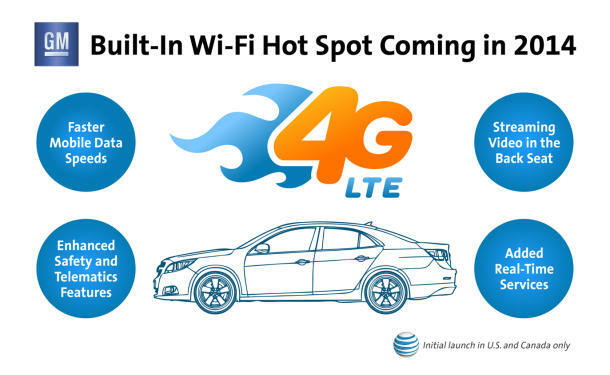 For telco’s there is potentially more at stake. Bigdata provides opportunities for operators to become more customer centric and become more relevant in their consumer’s lives. If done right they could become this lifestyle provider they have always dreamt off becoming. By strengthening relationships with governments and selected enterprises they could also take a more active role in the community and by that increase their relevance both for consumers and enterprises.